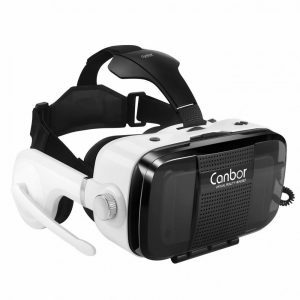 Home Reviews Canbor VR Headset Review – Worth Buying or Next? Canbor VR Headset Review – Worth Buying or Next? More and more people are taking advantage of virtual reality technology to enjoy immersive 360° videos and exciting 3D gaming. Nowadays, certain VR headsets come with a Bluetooth remote control, allowing users to navigate the VR menus, control music and videos and a lot more with ease. Canbor VR headsets all come with a remote controller at very affordable prices. The Canbor VR headsets are compatible with iOS and Android smartphones and guarantee one of the best immersive experiences. Canbor VR headsets are one of the top selling mobile virtual reality headsets and are sort of a benchmark amongst cheap VR headsets. Without wasting any time, we will jump directly into the review section. 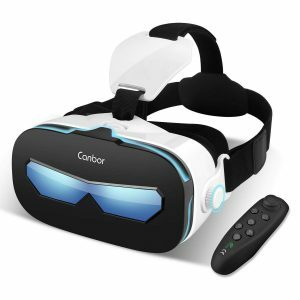 There are currently three Canbor VR headset models available on Amazon – keep reading to find out the pros and cons of each. The relatively low-cost model scores high amongst the cheap VR headsets. Those who are just starting with VR should go for this model, as it is well designed and easy to use. The model uses tried and tested technology with an adjustable lens. This gives the users more immersion and higher clarity. Moreover, this model boasts HD anti-blue light and anti-radiation lens which prevents the straining of eyes and protects the eyes from light emitted from the screen. This model is designed to fit most of the non-curved smartphones of different screen sizes (4-6 inches) providing an immersive experience for any ages. The eco-friendly durable leather strap fits perfectly over the head. The three straps adjustable design ensures that it doesn’t put any pressure on the nose and head. 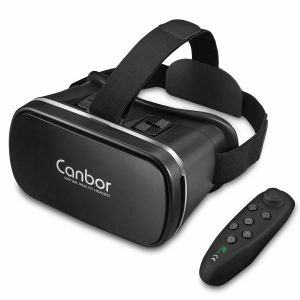 This variant of the Canbor VR Headset is close to the previous model. However, its design is definitely more appealing. Moreover, it also comes with a remote controller. Most of the VR headset models available in the market lack comfort. This is mostly because they are heavy and put pressure on the head and bridge of the nose. However, this model only weighs 280 grams and the user can enjoy the 3D experience without any strain on the neck or nose. This model of Canbor VR Headset uses HD anti-blue light PMMA lens. It provides crystal clear 3D visual effects while protecting the eyes from the blue light. Moreover, those with myopia (nearsightedness) are not required to wear glasses while using this headset. Its adjustable PD (pupil distance) and FD (focal distance) is suitable for most people. Its simple but effective design is quite noticeable. It has a semi-enclosed smartphone cabin for heat dissipation. This model is extremely similar to the first Canbor VR headset model with almost the same features. This model is suitable for any age including kids and adults. Moreover, the quality of this VR headset model seemed pretty good as compared to the two previous models. The headset is composed of PMMA induced aspheric optical resin lenses with anti-radiation and anti-blue light features. The lenses prevent the unnecessary fuzziness and offer a clear view for long exposure. With FOV 120°, the user can enjoy immersive 3D private cinema anywhere. The headset offers stunning audio-virtual sound with its inbuilt stereo microphones and earphones. Moreover, it sports HiFi headphones and memory sponge that reduces the strain on the ears. The T-sharp headband and soft leather strap provide comfortable and flexible wearing. The design decreases the pressure on the nose and three heat dissipation holes on both sides of the headset. All three models are quite similar overall. If you are a beginner and new to virtual reality, these three models will provide you with everything to get started. Previous articleSteelSeries Stratus XL Review – Upgrade Your VR!